Taken from among the document collections related to Army’s aviation strategy, this tranche includes strategy documents mainly from the Australian front along with field diaries produced by airfield battalions and field airfield construction units. Document collection related to the Navy’s strategy on the Southeast Asian front during the Greater East Asia War. Includes strategy documents related to the Bismarck Archipelago, New Guinea, and the Solomon Islands. Document collection focused on combat lessons drafted by the Army Department, Imperial Headquarters. Documents comprise mainly combat lesson reports, combat lesson special bulletins, and combat lesson quick reports. Also included are collections of skirmish examples produced by the Inspectorate General of Military Training. Document collection focused on telegrams sent and received by naval vessels and shore-based units. Comprises mainly sets of telegrams on strategic matters including items on strategy on the southwestern Pacific front. Includes the Naval General Staff’s table of abbreviations for specific places and the Navy Ministry’s table of abbreviations for use in naval dispatches. After starting in November 2004, the ten-volume book series History of Sagamihara City was completed in 2018. Here we will discuss the May 2017 volume titled Sagamihara Historical Modern Records, which benefited from the usage of resources made available by Japan Center for Asian Historical Records (JACAR). History of Sagamihara City examines Sagamihara before its merger with four towns in 2006 - 2007, and it aims to be a project belonging to the genre of regional histories. The work unearths regional materials that had been buried and is an effort to reconfigure historical understanding with them and all the records available in the region. In Sagamihara Historical Modern Records, documents handled by JACAR were pivotal in terms of both grasping history in the large scope and in its particulars. Materials remaining in Sagamihara were inevitably left fragmented, so they are insufficient to see the big picture of the city’s history. Chapter Six of Sagamihara Historical Modern Records, “Progress of Industry and Transportation” has a fourth section "Planning and laying of railroads" that we have written on. Specifically, it is about materials involving the Yokohama Railway/Yokohama Line (now JR Yokohama Line), Odawara Express Railway (Currently Odakyu Electric Railway), Sagami Railway (Current JR Sagami Line), and the unfinished Sobu Electric Railway and Nanshin Electric Railway. Materials of Sagami Railway and Sobu Electric Railway were left in descendants in the city, so we were able to read them. A description of opening day for the Yokohama Railway can be found in Aizawa Diary along with reprinted details on the transportation and governmental system. We learned that for profit the nation of Japan seized Yokohama Railway based on a Cabinet decision, as seen in reprinted documents of the Ministry of Railways (held in National Archives of Japan). Many of the materials in this fourth section were reprinted from Records of the Ministry of Railways. Materials that remained in the local governmental system area as well as those from Records of the Ministry of Railways clarified the railway system and its development. Next We shall discuss materials necessary for retracing the special circumstances of Sagamihara: documents on pre-war military construction. From 1937 to 1943 a relocation and construction occurred in Sagamihara for Japanese eight army facilities, to remake the city as a military capital. This included the Military Academy, Temporary Army Hospital, Sagami Army Ordnance Arsenal, and Army Engineering School. To respond to these army developments, Sagamihara became the subject of urban planning laws as an emerging industrial city by Kanagawa Prefecture, and was designated with a merger in 1941 as the expanded Sagamihara-machi. Even today, the cornerstone of contemporary urban planning in Sagamihara owes much to this land area arrangement project. There are a relative high number of documents related to the relocation of the Military Academy around Sagamihara, but most of the army facility information was not stored locally. Documents on army infrastructure were treated as military secrets, so almost none are left. Chapter Nine "Military City Plan and Sagamihara" of Sagamihara Historical Modern Records relied greatly on materials from sources including newspapers, diaries, Goshomei Gempon : Script signed by the Emperor (held in National Archives of Japan), and Syusen Syori : End-of-War Settlement (held in the National Institute for Defense Studies, Ministry of Defense). In particular, the documents also includes important, comprehensive documentation on the progress of the establishment of army facilities named above and there are detailed answers about the secret military matters made clear that were collected in response to questions from the post-war US military’s headquarters in Japan. From the viewpoint of the editor putting together the municipalities' history with all these resources, the fact that original documents today can be examined directly online and that no special permission is required for secondary use (reprinting) brings a tremendous benefit to editors and writers even if there is added responsibility. In the 2014 preparations for the History of Sagamihara City: Contemporary Theme Volume, I worked hard checking matters and typing out the top secret military records of Professor Kinbara Samon of Mitsu Dainikki (held in the National Institute for Defense Studies). Although only a few years have passed and the basic work has not changed, the convenience now for confirming original documents has been improved greatly thanks to JACAR. I look forward to seeing it further expand. Located about 40KM west of Tokyo, the city of Sagamihara once hosted the canoe competitions during the 1964 Tokyo Olympics and is currently home to the JAXA (Japan Aerospace Exploration Agency) Sagamihara Campus, famous for the asteroid explorer Hayabusa and Hayabusa 2. Sagamihara is also where the United States Army built the U.S. Army Sagami Depot. There are many citizens who do not know that Sagamihara was once a military town, especially those in their twenties and thirties. Today, Sagamihara is a government-designated city with a population of 720,000 people, but in the early 20th century, only 30,000 people lived in Sagamihara. What transformed Sagamihara into a modern city? It is thought that there were many problems and sacrifices in the process of transformation from a military town and into a modern city. Using official historical documents, the exhibition aims to show the facts surrounding these issues. From February 15th to April 8th, 2018, our Archives organized a three-part exhibition on Sagamihara and the Military Town Plan, titled respectively "Relocation of Army Facilities", "Sagamihara Military Town Plan" and "Sagami River Water Control Project". Over a decade, including the World War Two, we have traced what happened with fragments of documents and official records available in Sagamihara. 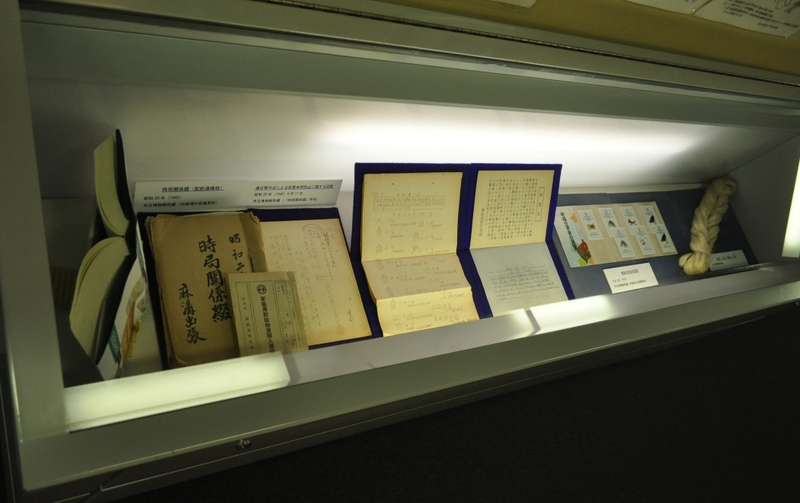 Many of the documents were found in the digital archive of the Japan Center for Asian Historical Records (JACAR). From JACAR’s digital archive, we located publicly released documents from the National Archives of Japan, the Diplomatic Archives of the Ministry of Foreign Affairs of Japan, and the National Institute for Defense Studies. We also visited these places and took photographs of the originals. 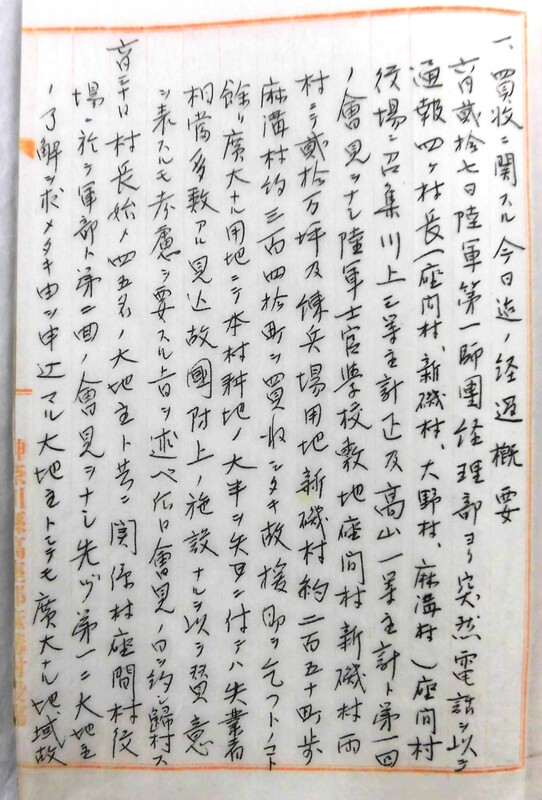 Especially at the National Institute for Defense Studies, my hands trembled when I came across a secret red stamp and red pencil lines indicating western Sagamihara in a 1936 text titled "The second agenda item of the Military Academy Main Course" in the document The Newly Established Position of the Military Academy. In 1937, the Military Academy was relocated to Sagamihara from Ichigaya, Tokyo. 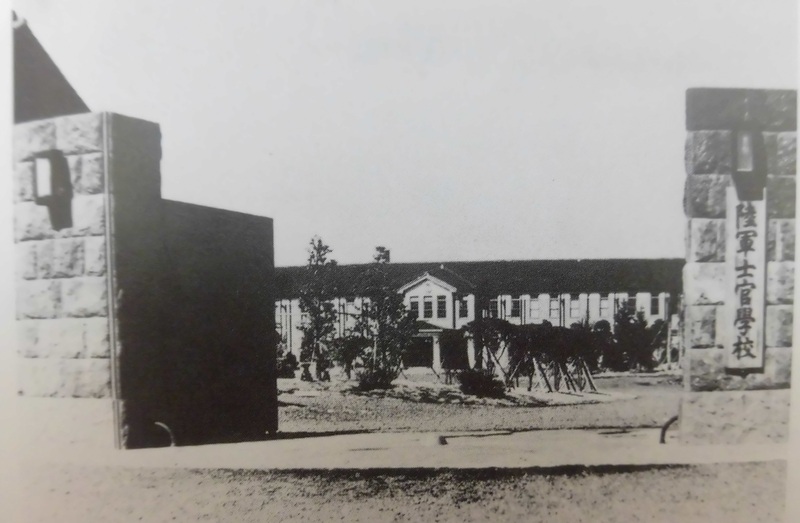 From 1938 to 1942, eight army facilities -the Temporary Hospital of Tokyo Third Army, the Sagami Army Ordnance Arsenal, the Armored Vehicle Maintenance School, etc.- were relocated to Sagamihara. To respond to the rapid increase of military institutions, in September 1939, the Sagami Army Ordnance Arsenal in the northern part of Sagamihara focused its efforts on the Sagamihara Urban Construction Participation Project, as is explained by the Kanagawa Prefectural Assembly. Sagamihara became a city by merging two towns and six villages on April 29, 1941. City planning laws, roads, transportation, housing, and commercial prospects were improved. Today, the ordered townscape around the current city hall, parks, and Route 16, the national highway are due to arrangements from the 1940s. Other successful plans included the Sagami River Water Control Project, which was based on survey results conducted in 1933 by the Ministry of Agriculture and Forestry to create electricity, control irrigation, and manage water supply. Also notable were the beginning of the Kanagawa Prefecture Extraordinary Council’s construction of the Sagami Dam at Lake Sagami in January 1938 and the introduction of new water supply to the Sagami Army Ordnance Arsenal in August 1942. After the end of the World War Two, although many army facilities were taken over by the US military, some were returned to the Government of Japan. The Sagamihara City Museum and the JAXA Sagamihara Campus were built on the site of the Armored Vehicle Maintenance School (Camp Fuchinobe). In addition, the Sagami Army Ordnance Arsenal became the U.S. Army Sagami General Depot and is still used today. Why was part of Sagamihara selected for Japanese military land acquisition and relocation of army facilities over a short period? Although we have looked for a detailed reason in historical documents, no clear answer could be found. It would not be an exaggeration to say that Sagamihara was transformed from a small town into a large city with the plan to make it into a military town with the Military Academy and other institutions. Without the relocation of the Military Academy, it is likely that neither Route 16 nor Sagami Dam would have been built – both of which appear to have played an instrumental role in developing the foundation for the modernization and urbanization of Sagamihara. With the construction of the Linear Central Shinkansen today at Kanagawa Prefecture Station (tentative name) and other projects across Sagamihara, the exhibition was a good opportunity to look back on the foundation of Sagamihara. 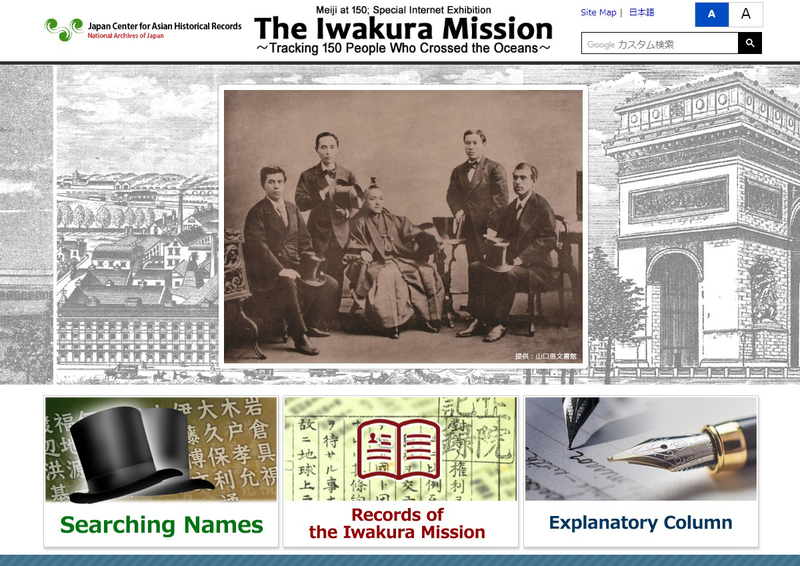 "Iwakura Mission — The 150 People Who Voyaged from Japan Across the World"
We will release an English version of the Special Internet Exhibition "Iwakura Mission — The 150 People Who Voyaged from Japan Across the World". From the Japanese version we made excerpts of “View by Name”,“Record of the Iwakura Mission”, and“Commentary Column”. Held a booth exhibition at the annual conference of AAS in Denver. In 2019, the Emperor of Japan will retire and be replaced by the Crown Prince. 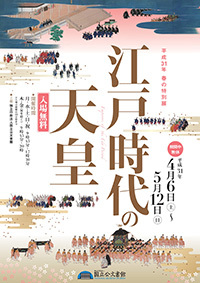 This exhibition commemorates the abdication and change of throne by examining emperors of the Edo period, especially on how the emperors and the Imperial Court built relationships with the military shogunate and the preceding warrior rulers such as Oda Nobunaga, Toyotomi Hideyoshi, and Tokugawa Ieyasu. The revival of court rituals lead by Emperor Kōkaku, as well as the procedures of changing and adopting the era names in the Edo period, are among the topics to be presented through the illustrated handscrolls and the court nobles’ diaries. Books refering to JACAR or documents from its database donated in current year are as follows. Thank you for reading the JACAR Newsletter No.28, and we hope you enjoyed it..